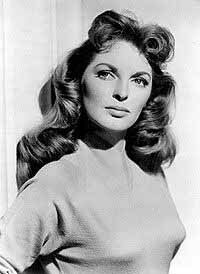 Julie London welcomes fall in a "sweater girl" shot from the year The Red House was released. Speaking of smoking, check out this archeological find: a link to a Real Player file of Julie singing a Marlboro jingle. The Siren knows exactly which buttons to push, albeit unknowingly: I'm a huge Julie fan, and have about 25 of her albums on CD (most of them memorized note-for-note; she's one of the jazz-pop greats, in my book). I really like her in Anthony Mann's Man Of The West (with Gary Cooper) and in a great dream sequence in which she sings her signature tune "Cry Me A River" in Frank Tashlin's The Girl Can't Help It. Of course no sang the Mickey Mouse Club song like Julie. Yes, what a fantastic version. All of two minutes, with just one jazz guitar for accompaniment, and it sounds incredible. (And sung, knowingly, with not a whit of irony). *Flummoxed* You're serious. She really does sing Mickey Mouse? My ex-roommate had a wonderful compilation of her singing but that wasn't on it. She really was something in The Red House and I will look forward to seeing her in something else. One thing I didn't know until I checked IMDB: she was on "Emergency!" in the 1970s as Nurse Dixie.